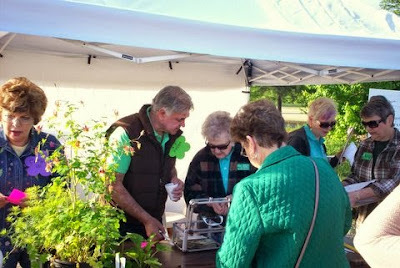 The Spring Plant Sale is the Club's major fund raiser. on Hwy 71 in Bella Vista. Wow! Wow! Wow! What a sale. Kudo's to all who helped. Starting with the committee Chair Alycyn Culberson and her tireless efforts to all the diggers and potters, labelers, pricers, etc.. I know everyone is waiting to hear how good. Gross plant sales were $4673, ways and means $508 for a total of $5161 resulting in a net profit after expenses of $4669. That's $1737 more than last year, which is an increase of 60%. Again Wow, Wow, Wow, you all did it, take a bow, I'm so proud. 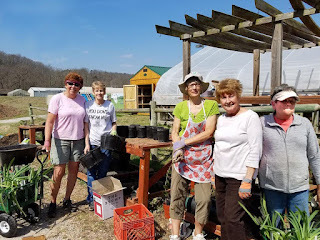 The truly amazing thing is that back in March, thru all the digging and potting (photos left & above), there were SO MANY BVGC MEMBERS WHO PITCHED IN, DIG AFTER DIG, pot after pot! Truly a club event and a club effort! We are so fortunate to have so many pitching in! I know I run the risk of forgetting peeps when I start naming names, and I am tired enough, as you all are, that it might happen, please forgive if I failed to mention you, but this is a good start...one last mention that adds a bit to this feat is that many of us are master gardeners and worked out tails off for 3 days last Fri, Sat and Sunday at the Expo then rolled into our BVGC SPS...Lots of love here...Kudos to the Ways and Means gals too and a HUGE thanks to you all...and not least...a true leader, an example and an inspiration...Tony. love u boss. 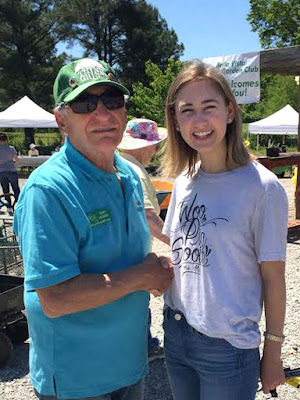 Photo left - Club President, Tony LiCausi, and Georgina Carrico, University of Arkansas student and one of our two Dorothy Wallace Scholarship winners. Georgina is the first scholarship winner to attend an event other than the September meeting where the winners are introduced to the Club members. She is an outstanding student. One of her major influences was her grandmother who was a Master Gardener. BVGC! 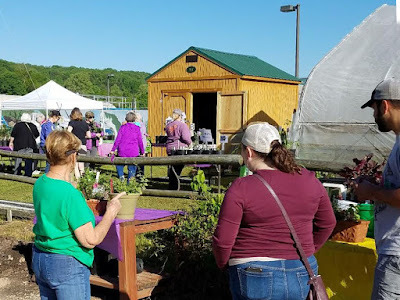 What an amazing and fantastic day at the Spring Plant Sale today! I want to thank EACH and every ONE OF YOU for all the effort! We started digging and potting in late March and worked hard thru late April. had Master Gardener things that kept me at bay...love you Cathy! marked plants, priced plants, moved plants....SO MUCH WORK and SO many people pitching in! And Tony...love you and thank you for your love, support and encouragement! It was fun! Not bad for MY FIRST BVGC Spring plant sale. 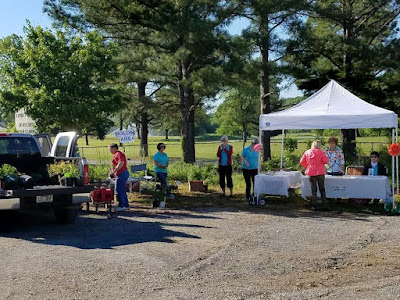 The Bella Vista Garden Club Spring Plant Sale was very successful this year, thanks to tremendous local support and GRRREEEEEAAAT Weather. This is our most important fundraiser to support the Garden Club Mission of beautifying Bella Vista and Northwest Arkansas. Our greatest thanks must go to the Diggers and Potters under the supervision of Co-Chair Val Courter. 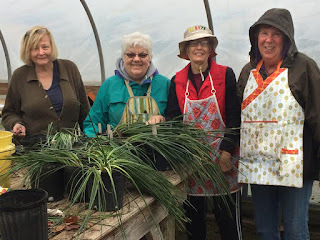 I think they had the most fun as they saw the gardens up close, made friends with the garden visionaries, and restocked their own gardens with the broken and wounded plants put into new garden ideas. This was the place to get new gardening experience. The teamwork and companionship on repotting plants was definitely accentuated by the supplies of donated potting soil and biosoil from Kitty's supply system. The many master gardeners who came out to help us pot were really appreciated as they well know, but we need more of them next year. A special honor goes to Master Gardener Lou Jasper, who seems to have earned the vote of "most knowledgeable plant professional" in our garden club, but she led Co-Chairman Marilee Leonard, a lowly MG trainee, in naming and pricing hundreds of unknown plants. "Get Knowledge!" Many thanks must be sent to those who allowed our gardeners to dig plants from their beautiful gardens for our sale. Many of our own members dug and potted their own contributions for the sale. We have moved overstocked supply of plants from the students of the University of Arkansas Horticulture Club for several years for 50% of the revenue generated and appreciate using them as a supplier. We also received some plants from the Benton County Master Gardeners overstocked supply and appreciated their support. They had a great sale also. We are especially thankful to those who donated supplies from the nursery and gardening industry to the BVGC, namely Scotts, Home DePot, Allen's Grocery, Diamond Manufacturing Company and the Village Wastewater Company. Co-Chair Alycyn Culbertson was the Great Coordinator of buying those new signs, getting out the flyers, coordinating the Allen's support, etc. so everyone would know we really have a Bella Vista Garden Club. 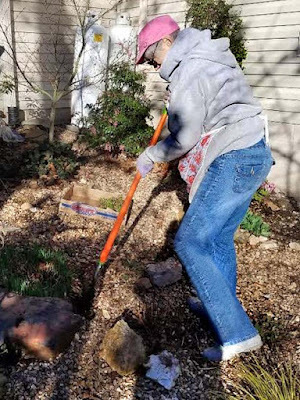 She was the front line of coordination and idea person between BVGC and the Master Gardeners where she proved what a "mover and shaker" really does. 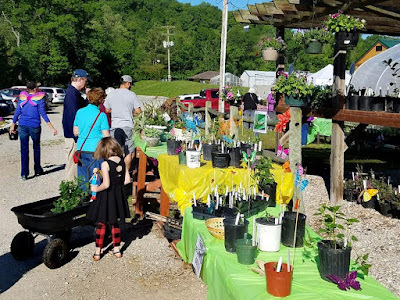 We had Ray Matkowski, Roy Leonard and Bill Hodges building potting benches, hauling plants, negotiating donations, and doing necessary pachyderm support to make the Spring Sale a real success. SMASHING BEAUTIFICATION TIME! The Spring Plant Sale was a smash. Net profit for the Plant Sale is $2,901.38. Also, a big thank you goes out to Jack Kennedy and his friend Ed Moczydlowski for giving the club the proceeds of their golf ball sales, $363.00. Adding the golf balls into Ways and Means, the grand total will be $1,350.35. I also want to thank all of those who worked quietly behind the seine showing up at the diggings and helping when needed. Don't wait for someone else to bring you flowers. Plant your own and decorate your soul.